Tip 1. Always shop in advance so you don’t need to get anything the day of the dinner party. Tip 3. Reach for my Mom’s rack of lamb recipe - a.k.a. Monday Night Lamb. This dish is so easy you can throw it together on a Monday night after a rough day at work. And it’s impressive. With crispy potatoes cooking underneath, it only takes minutes to prep, and only 45 minutes in the oven. Tip 4. Always have a bag of frozen peas in the freezer and fresh celery in the crisper. Peas, on their own murmur “Boring.” But, sauté a little celery in butter and then add peas? It’s a horse of a different color. Tip 5. Forty-five minutes is the perfect cooking time for any dinner party. You pop your meal in the oven when you hear your guests pull in the driveway, and then enjoy the appropriate amount of time nibbling, sipping, and catching up before serving. Tip 6. 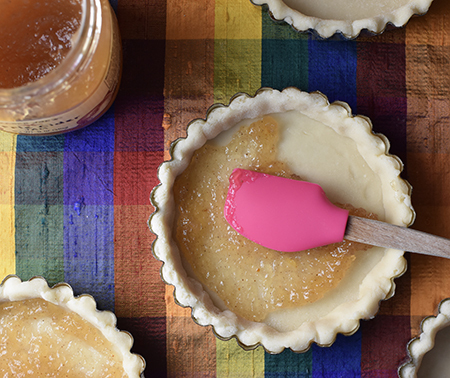 Bake dessert before you go to work. I know it sounds unwieldy, but it really isn’t bad. You might have to give up reading The Times that morning, but - believe me - dessert is always more enjoyable than the news. That brings us to today’s recipe. When I made the invitation via hands-free phone on the homeward commute, I bought groceries on the way home, but I still didn’t have a dessert plan until I the next morning. After looking, I discovered one apple. How could I stretch that for four people? 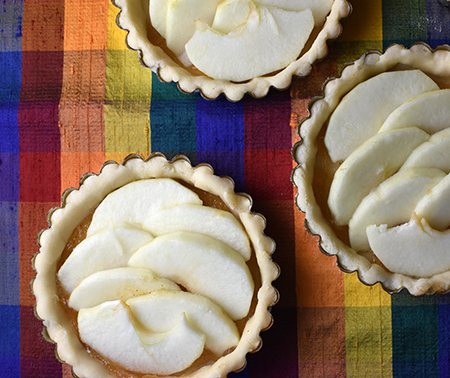 Individual Apple Tarts, that’s how. 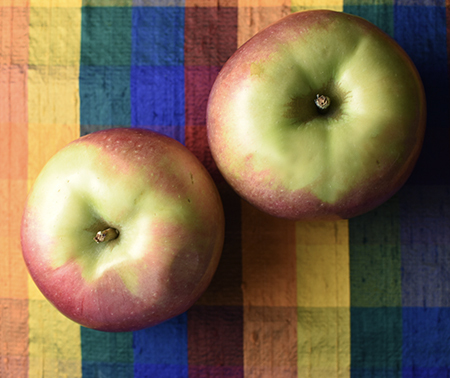 It only takes one apple and one hour out of your morning routine... consider it your morning workout, if you must. 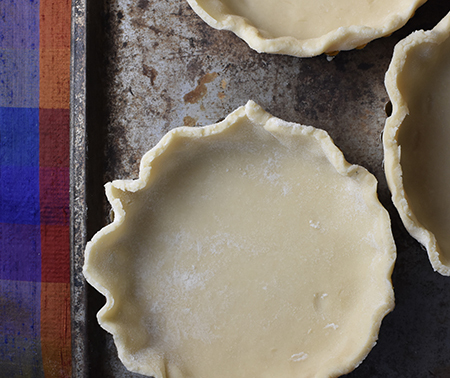 Make the crust. 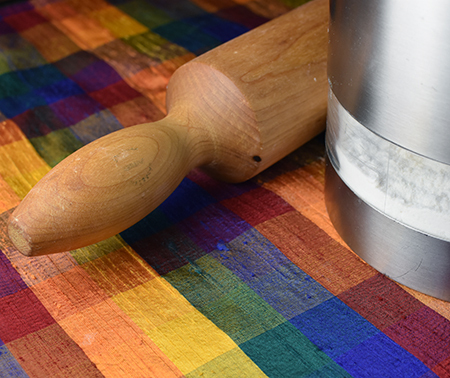 Place flour in the bowl of a food processor, and add the butter (cut into 16 pieces). Feel free to add a pinch of salt, if you like. I do sometimes, but generally not with fruit desserts. Pulse 10 times, then sprinkle with the water. Process until it forms a ball. Roll the dough to 1/8-inch thick. Cut out four 6-inch circles of dough. 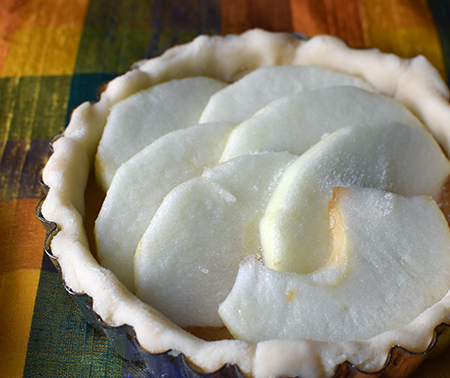 Place each circle into a 4-inch tart pan with removable bottom. Fold edges down and press into the sides of the pan. Trip tops, if necessary. 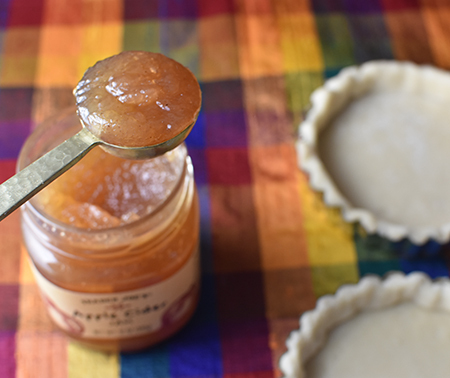 Spread 1 tablespoon of jam evenly onto each crust. Peel, core apple, and quarter the apple. Cut each quarter into 7 even slices. Arrange 8 slices onto the top of each crust in a shingle pattern. Sprinkle each with 1/4 teaspoon of superfine sugar. Bake for 30 minutes, until the jam is bubbling away under the apples. Let cool on a rack and then remove from the tart pan. 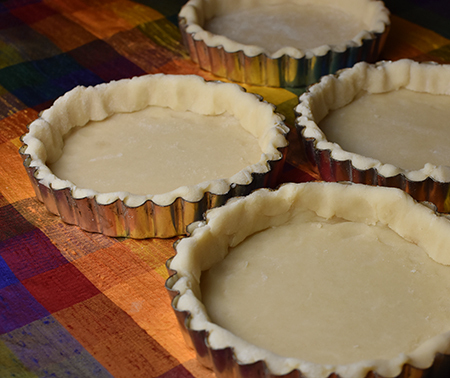 Serve each tart with a scoop of vanilla ice cream, if desired. David, an admirable morning workout. I suppose I could put together something in an hour or so, but I'd prefer more time. Now, Eva is a master at quick simple and very tasty dinners. Her trick for dessert when we lived in the USA was to buy a frozen Marie Callender's Lattice Apple Pie, which just happened to fit perfectly in one of her Emile Henry pie dishes. 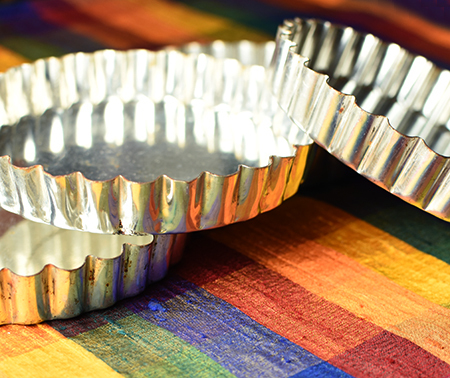 She'd carefully remove the frozen pie from the box, remove the aluminum tin and bake it in her nice dish. She was famous for her homemade apple pie. I love Eva's trick, Ron - but I will stick to my morning calisthenics! :) As I said to someone, it is therapy for me. I need the creativity in my life! You're most organized! A skill we Italians lost in our gene pool! Haha! To be honest, I have no issues pulling together a last minute dinner, but my kitchen will look like a bomb blew up in it! 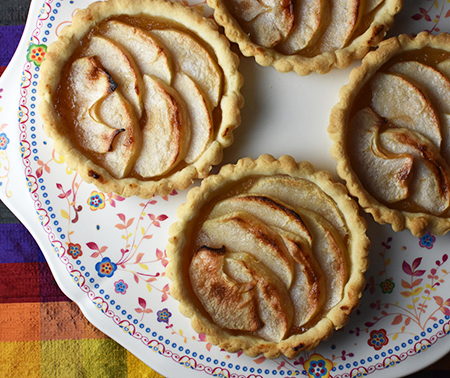 ;) Your apple tarts look lovely! 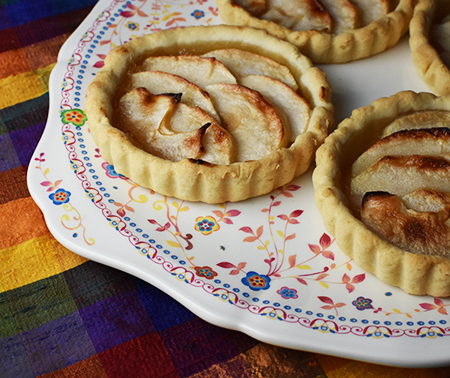 Even easier and quicker is if you have frozen puff pastry and do the same with the apples. Love those, too! Oh, Christina - that is not true! Every nonna I have met is incredibly organized! And I didn't say the kitchen didn't look like a war zone... :) I prefer a tender crust with apples and most commercial puff pastry is too tough for my liking... and the one that is not is almost $13 for one crust! For that, i will make a food processor crust and be happy! I know - when it is in stock, I stock up, too... otherwise it's DuFour for $13! Thanks, Davorka! Yes it is shantung - we made ourselves a little tablecloth of this shantung when we lived in Maine and had a tiny dining table in our little conservatory. I think shantung is one of my favorite of all fabrics! Have a wonderful day! Impressive planning in just 24 hours! I'm loving that 45 minutes to chat and have a cocktail before sitting down to dinner. I love getting things done ahead of time so you can -- especially dessert! That way the actual meal is always more relaxing. And yum to this dessert! I like a challenge, Valentina! :) We were taught by an elderly friend (90 something) that cocktails should always be 45 minutes. I am not sure if this was an Emily Post rule or what, but we abide the rule! Mark like to have the house and meal in such good shape that when our guests arrive, they look around at the calm scene and ask if they arrived the wrong night! Well, this does not quite equate to my meaning of 'impromptu' :)! Extremely well planned and executed. And you made that one apple go a long way . . . I would probably have bitten into it whilst searching for morning ideas . . . . ! It's so funny Eha - I never bite into an apple! So it was safe for the tarts! :) If it were a chocolate bar? Yes! David, I can't believe how organized and efficient you are! Your tips for planning ahead are very useful. And your menu is outstanding! Quite a fine meal. Stretching that one apple into a lovely dessert was brilliant! Thanks, Kelly! Working full time requires me to be really organized. And it is kind of fun! Ste - we are so lucky that Trader Joe's carries excellent New Zealand lamb at really good prices. I will have to check out the melted butter pastry - never heard of or seen it. I wonder if it is akin to the pastry made with oil? David, you've certainly inspired me to be more organized for my dinner 'parties' (which usually only amount to two invited guests). Recently I have been over-doing it with complicated dishes, which means I have been stuck in the kitchen while my husband entertains the guests. But I'm now mending my ways by doing just a one-pot main course and (I hate to admit it)a delicious Boston Cream Pie from our local supermarket (Von's). Now I must search for your mom's lamb dish! Actually, Fran, the more guests coming the more feel the need for major organization! One lucky/unlucky thing for me - our kitchen is open to the living and dining rooms! The lucky part is that I can chat with the gusts even when in the kitchen. The unlucky part? They can see in the kitchen from everywhere. Thus, it always needs to look tidy and calm. It is good training! I should start making dessert instead of reading the news. Really, it'd help my sanity. Anyway, what a nice dessert. Worthy of being in the food pages of the Times! Cooking/baking is DEFINITELY better than reading or watching the news, John! And thank you for that truly amazing comoleiment! Making desserts in the morning is definitely therapeutic for me. 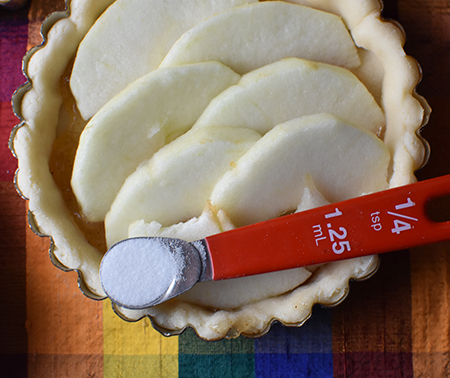 I love those cute little apple pies. Have a great weekend. David, back in the day when I had frequent dinner parties, I might have pulled this off. But now I need a bit more planning time. OR I need to start entertaining more often! 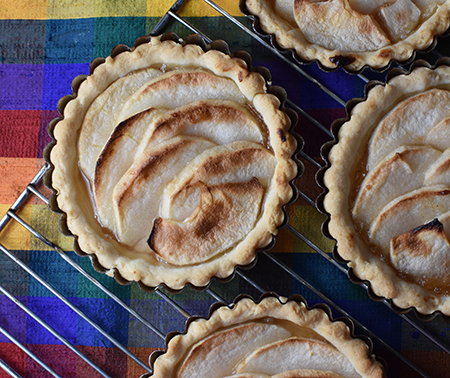 Your tarts look gorgeous. The funny thing is, Jean, that Mark tells me we need to stop all the entertaining we do! Maybe I will lose my organization skills if we do! Thanks, Pauline - and welcome to Cocoa & Lavender! By coincidence, this weekend is my 9th anniversary of writing the blog - my first post in 2010 was on Valentine's Day! If you ever have any questions, just let me know! Some great tips here, and yes I too have been caught out with the camera battery being dead. Isn't that the worst feeling, Emma? But it happens a little too often for my liking! Your organisational skills are impressive, David. I don't think I've made desserts in the morning since getting out of the commercial kitchen, although I do start marinading meats early in the day! I must revisit your easy rack of lamb, and now I'm yearning for your apple tarts at 7am in this hotel bed in Kyoto! You are so lucky to have such great lamb there, John! If I lived there, i might have it once a week! I think having a kitchen open to the living and dining rooms has forced/taught me to be organized. It really helps! I'm very impressed with your great organizational skills but even more so for creating a dessert with only one apple. Fantastic job! Necessity os the other of invention... and is one apple. Thanks, Karen! You are certainly one organized person - I am quite impressed. Much more than I am...be that as it may, I could not agree with you more on this recipe, I often make apple tarts (albeit with puff pastry) for a last minute dessert, so I just know that these little gems tasted absolutely wonderful (with or without the vanilla ice cream on top - btw we love our apple tarst with crème fraîche which rather rich yet tart). Is it the weekend already? Gott sei Dank!